Nocciola and Gianduia Aprons There are 12 products. 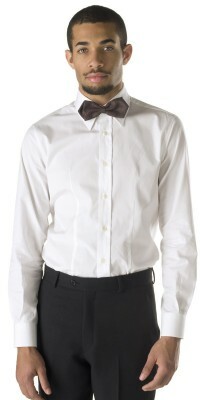 Corbara’s professional wear: find out the bar uniforms in the trendy Nocciola (Hazel) and Gianduia colours. 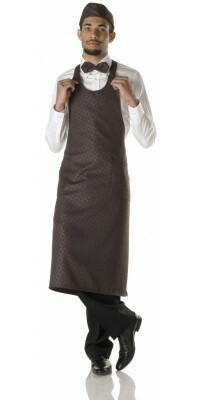 This series of bar uniforms, perfect for pastry shops and ice-cream shops too, is made of wrinkle free Gabardine Plus (100% Polyester), which is processed with a special technique that stamps a pattern, called “Vanity”, in relief. There are two models of aprons, both proposed with bib: Alassio Apron, often preferred by women as it is shorter, and Luino Apron, more suitable for the male figure for its generous dimensions...even though, as well as all our aprons, they are both unisex. As coordinated accessories, in addition to the pretty Armony Papillon, there is the nice Nodino, a kind of small women's tie (which arrives with the knot already done). In bar uniforms, hats cannot miss; in this series two models are proposed: the Vibo Forage Hat and the Agnese Pillbox Hat. 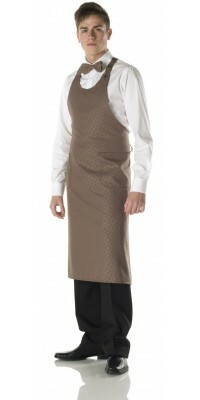 Long apron with bib, model Luino two pockets applied, unisex Fabric with raised pattern Vanity - Nocciola (Hazelnut) colour Adjustable one size Made of Gabardine Plus, 100% Pol. Short apron with bib, model Alassio two pockets applied - unisex Fabric with raised pattern Vanity - Nocciola (Hazelnut) colour Adjustable one size Made of Gabardine Plus, 100% Pol. Short apron with bib, model Alassio two pockets applied - unisex Fabric with raised pattern Vanity - Gianduja colourAdjustable one sizeMade of Gabardine Plus, 100% Pol. Long apron with bib, model Luino two pockets applied, unisexFabric with raised pattern Vanity - Gianduja colour Adjustable one sizeMade of Gabardine Plus, 100% Pol. Short tie, model Nodinowith the knot already doneFabric with raised pattern, Nocciola (Hazelnut) colouradjustable one sizeMade of Gabardine Plus, 100% Pol. Bow tie, model ArmonyFabric with raised pattern Vanity, Nocciola (Hazelnut) colourAdjustable one sizeMade of Gabardine Plus, 100% Pol. Short tie, model Nodinowith the knot already doneFabric with raised pattern, Gianduja colouradjustable one sizeMade of Gabardine Plus, 100% Pol. Bow tie, model Armony Fabric with raised pattern Vanity, Gianduja colourAdjustable one sizeMade of Gabardine Plus, 100% Pol.